Community Insight is centred around you, the users, and we want to ensure that you can get the very most out of Community Insight. So, we have re-invented all our support materials to make navigating and using Community Insight an even easier experience for you. All the support materials you need are now all in one place – the Knowledge Base, which you can access through clicking on the Support tab on Community Insight. The Knowledge Base is a collection of bite-sized articles designed to make your experience of using Community Insight as simple as possible. 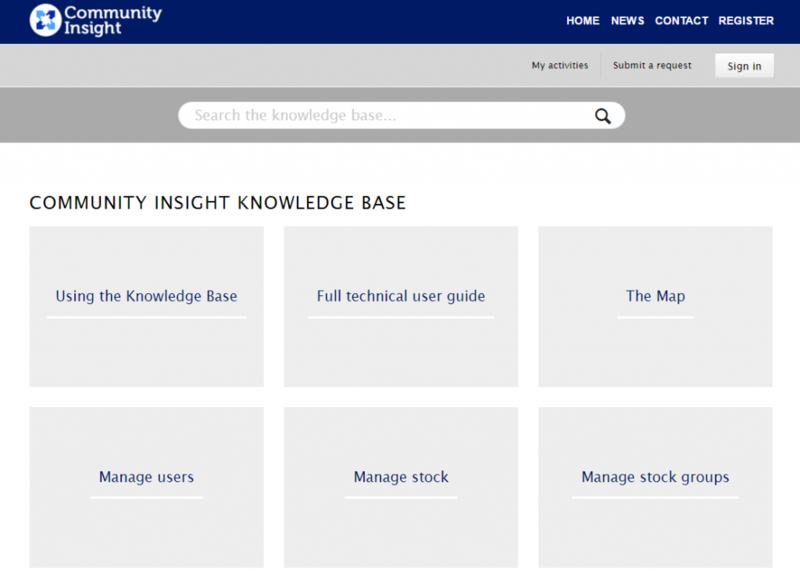 The Knowledge Base is broken down into categories covering all the main features of Community Insight, so you can find the information you require quickly and easily. Use the search bar located at the top of the Knowledge Base to search for key words. This will bring back a list of articles that contain this key word or phrase. The Knowledge Base contains informative articles, running you through the feature functionality step by step. In addition we are continually adding articles which provide you with the extra knowledge and tools to become the data hero in your organisation. The Knowledge Base will be a growing and evolving resource for you to use. We’ll be adding more and more as time goes on and your help will be invaluable! Upgraded feature alert on Community Insight! 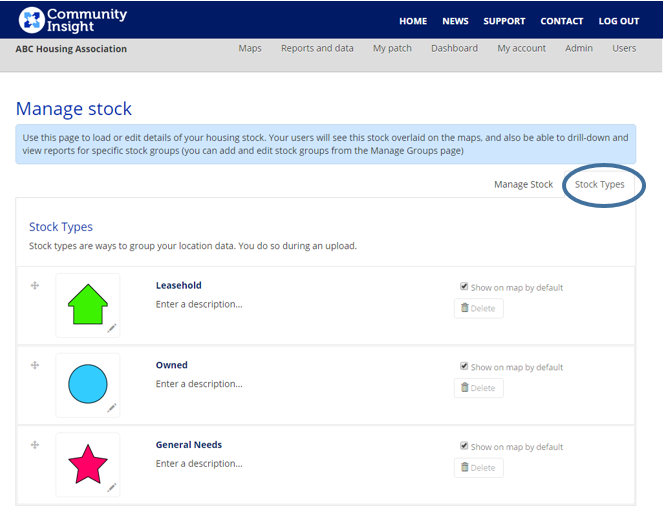 We are excited to announce that we have extended the number of stock types available on Community Insight England, Wales & Scotland. Up until now you have been restricted to 5 stock types, now you can have up to 30. It’s been a big piece of work and something on the top of a lot of users’ wish lists! We’re looking forward to hearing how you use this fresh functionality in your work. These latest updates allow you to differentiate between your stock, in even more detail. Uploading your stock and stock types works in exactly the same way – copying and pasting or uploading a CSV file. To see the 30 stock types in action, you will first need to re-upload your stock, increasing the number of stock types in the stock types column. Once uploaded you have the power to edit information about your stock types within Community Insight. Please note that to use this feature, you need to have Group Admin access. Power Users and View Reports users, will see the changes, but will not be able to edit stock types themselves. Edit the name and description of your stock types: If you want to change the name of one your stock types after uploading stock, you can now do this through the Stock Types page – rather than editing the name on the CSV file and re-uploading. Select which icons you would like to use for each stock type: Now that you have more stock types you need more icons for the map. Understanding that the stock you manage come in all shapes and sizes we have added in more icons to represent your stock on the map. Delete stock types: You can now remove stock types from within the Stock Types Please note: any postcodes from within deleted stock types will be put into the Unassigned stock type. Coming soon: even fancier icons! There are some more updates to come (don’t we treat you well!) and we will soon be adding in more icons, representing specific property types. Use these new icons to upload not only your stock but also community centres and other key local services. If you have any suggestions for icons you would like to see, let us know at support@ocsi.co.uk . Alongside the additional functionality, we have had a major spring clean of the Community Insight site. Insight regulars will notice that the Manage stock and Manage stock groups pages have been given a spruce to make them more intuitive and user friendly. There has also been lots of tidying behind the scenes, meaning that new functionality in the future will get to you quicker. Manage services: As we have mentioned, you upload your services to Community Insight in exactly the same way. This is where you will find the new functionality to manage your stock types within Community Insight. Manage custom areas: Although there haven’t been any changes to the way you create stock groups (you still draw on a map, select standard areas or upload postcodes), we have changed the aesthetics of the page. Let us know what you think! Data for your areas pop up: We have given the table containing data for your areas a spruce. All the same information is there – and is now even kinder to the eyes. All the support materials have been updated for Community Insight and can be found in the Support Centre of Community Insight. Please see section 2.2 and specifically section 2.2.4 in the user guide for more information on how to use the new stock types functionality. If you have any questions or you want to talk to us about how to get the most from the new stock types available we’d love to hear from you. Email us at support@ocsi.co.uk or give us a ring on +44 (0)1273 810270.